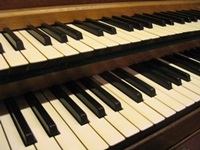 Organist and Pianist - Available across the South of England and beyond - Hampshire - Dorset - Sussex - Wiltshire - and further afield - just ask! Available for Weddings, Funerals and Services of Thanksgiving, Other “Occasional” Services, Civic Services, School End of Term Services, Concerts, Examinations, Recitals. Timothy Rice has over 40 years’ experience as a Pianist. The first instrument he learnt to play was the piano and only after achieving a high enough standard did he branch out to learn the organ. Timothy is an Associate of the London College of Music (piano playing) and is also an Associate of the Royal College of Organists. In addition to his regular playing commitments as an organist, Timothy enjoys being Accompanist to the Lymington Choral Society, and previously with Cantus - Ringwood Choral Society. Timothy is available as a qualified and experienced pianist and accompanist to play for concerts and examination candidates in Hampshire, Dorset, Sussex, Wiltshire and, subject to availability, further afield as well. He also provides music activities at Residential Homes, bringing familiar music, memories, mental stimulation and much pleasure to those he plays for. If you have a requirement, please do not hesitate to contact.